Confirmed Duplicates - are the duplicates with the identical contact information. Click on either category to expand and review the contacts. If you want to check the duplicated contact, please click on it. On the right side you can see more information about the clicked contact. 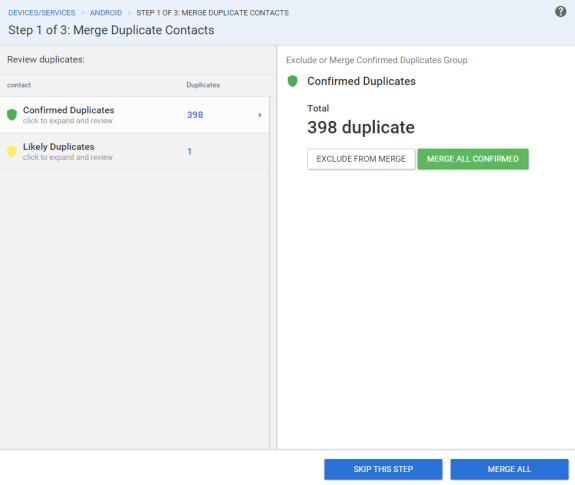 Skip this step – do it if you prefer to keep duplicated contacts and review them in the similar contacts merge step. 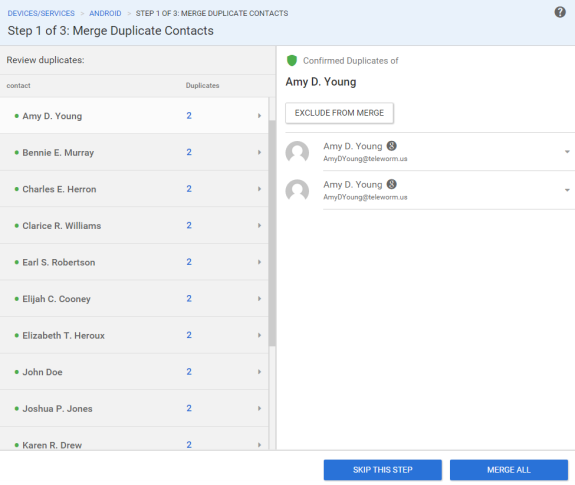 Merge all – merge all duplicated contacts into one. Exclude from merge - if you will exclude a contact, you will be able to see that contact in the similar contacts merge step (3rd step of the manual duplicate review). Please don't worry about merging different information, as all items that appear in these steps are contacts with identical or similar contact data. If you have any questions, you can write us an email, contact us via live chat, or call via phone.